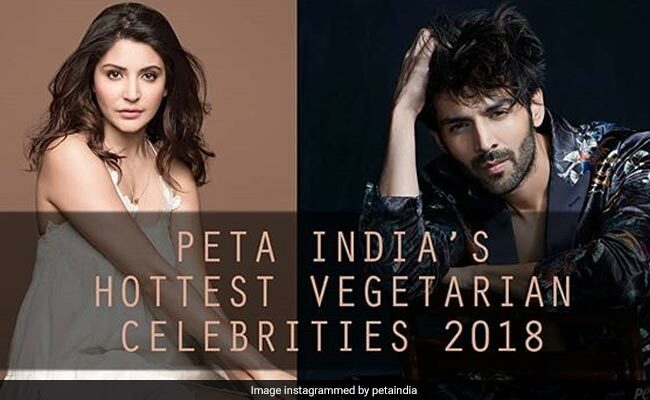 India's Hottest Vegetarians 2018: Kartik Aaryan and Anushka Sharma win in this year's poll hosted by PETA India. Just like every year, People for the Ethical Treatment of Animals (PETA) have announced the India's Hottest Vegetarians for the year of 2018. The names are two of the biggest actors from the Hindi film industry- Sui Dhaga actor Anushka Sharma and Lukka Chhuppi actor Kartik Aaryan. The names were announced after a poll on the website declared Sharma and Aaryan as the most-voted celebrities for the title. With this year's win, Anushka Sharma has become the first two-time winner of the title. She had previously bagged the title of India's Hottest Vegetarian in 2016. In 2017, she was also named PETA India's Person of The Year. The actor, who is celebrating her first wedding anniversary with Indian cricketer Virat Kohli today, starred in an ad campaign for PETA India. "I am Anushka Sharma, and I'm a vegetarian", Anushka Sharma had proclaimed in the advertisement. Anushka Sharma had also made headlines for her PAWsitive campaign around Diwali. The campaign raised awareness about the trauma suffered by animals due to the setting off of loud firecrackers. The campaign was also responsible for banning rides on horse-drawn carriages in Mumbai. The rides were a popular tourist attraction for people visiting the Queen's Necklace on Marine Drive, Mumbai. However, Anushka Sharma's decision to switch to vegetarianism was just motivated by altruism and her love for animals. She has revealed that going vegetarian was one of the best decisions she made as she felt healthier because of it. Talking about the health benefits of an all-vegetarian diet, Anushka Sharma said, "I have more energy, I feel healthier, and I'm so happy that no animals had to suffer for my meals." Meanwhile, Kartik Aaryan revealed that he was moved by a video that showed the cruel behaviour meted out to animals for their meat and that it was their suffering that motivated him to make this lifestyle change. Talking about switching to vegetarianism to help alleviate the sufferings of animals, Kartik said, "The kindest thing anybody can do for cows, pigs, chickens, and all animals is to stop eating them". Commenting on the newly named India's Hottest Vegetarians, Sachin Bangera, PETA's Associate Director of celebrity and public relations, said "Anushka Sharma and Kartik Aaryan are saving animals by keeping them off their plates, and by sharing their commitment to being meat-free with the world. Their compassion makes them as beautiful on the inside as they are on the outside, and that makes them winners in our book."